From our bar stools to our cocktail ingredients, everything at Cardinal Spirits has a story. Eventually, we'll tell you all of them. The bar stools at Cardinal Spirits. People always want to know where we got our bar stools. The right question to ask isn't where. It's who. 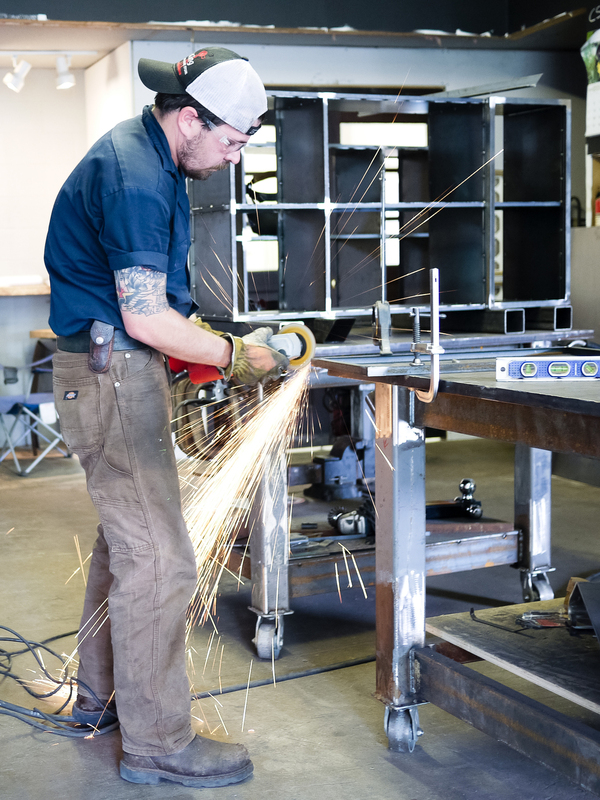 Our striking stools were made by Josh Smith, a metal fabricator here in Bloomington. Josh is the owner of Clutch Fabrication and Design, and he explains his work like this: "I make things that don’t exist." For Cardinal, that meant 16 bar stools, benches, a bike rack and hand rails for the front steps. Clutch and Cardinal share a love for clean, modern design and things that are made well by hand. Oh, and efficiency. One day we'd be casually sketching hand rails on a scrap of paper, and, like magic, the rails would appear the next day. In the months before we opened, Josh's red truck pulling up to the distillery was a reason to get excited — it meant something amazing had arrived. Josh owns a lot of hammers. This is one of them. CARDINAL: How did the design for the stools at Cardinal come about? JOSH: There’s a designer who made a hand juicer, and I’ve always loved it. The legs of the barstools came from the style of legs on the juicer. I just always thought they were awesome and it popped into my head for these stools. Brian (my mentor) taught me to do three drawings when you’re trying to sell a product. You’ve got the Yugo, the Cadillac and the Mercedes. You are aiming for the Cadillac in the middle, but you give the client three choices and hope they pick the one you like. Cardinal picked the one I liked. It was the first big furniture run that I had done. It’s reflective of what my capabilities have become as a shop. I like everything about them. They’re incredibly heavy. How much do they weigh? I would say at least 30 pounds. They’re not going anywhere. Maybe 50 pounds, I don’t really know. Cardinal bike racks and hand rails by Clutch. What was the first project that you were really proud of? That always changes because my style changes. I built my cake stand for my wedding. It was a three-tiered square cake stand and it had this curved pieces of steel in the back. I was just moving it the other day and I was like, man, these welds are terrible. Now I could build it 10 times nicer. My mom still has the log bench I built her when I was 8 years old. So I bet I was pretty proud of that when I was 8. Josh is making a bike rack for The Back Door bar. A really simple bike rack for The Back Door (a Bloomington bar). It’s nothing fancy, but instead of just going out and buying one, they were nice enough to contact me to do it. And then a big project that stems from the Cardinal bar stools is a big U-shaped desk with overhead cabinets, filing cabinets and slab wood. It’s going to be pretty wild when it’s done. Scratch built, designed in-house. (The client) just wanted a big crazy desk. It’s like 9-foot-by-9-foot. The piece of walnut wood for one side is seven feet long and three inches thick with live edges on both sides. Overhead cabinets for a desk in progress. I’ve been building stuff all my life, but it came in my early 20s when I got into motorcycles. I starting building stuff for those, all the way up to frames, and then it just snowballed from there. About three and half years ago is when I quit my normal job — my normal job back then was a piercer at a tattoo shop here in town — and started doing this full time. "This is my baby," Josh says of his anvil from the 1800s. Josh works on a bike rack. So, have you made a lot of furniture for your own house? No, the only things I have in my house that I made are a set of bookcases I built when I was 18. I don’t have anything else in my house that I built. It doesn’t pay my bills. I think about it all the time — I’m going to do this or that — and then I never do. Did you inherit your handiness? My dad taught me that I could do pretty much anything with just about anything. I took my dad’s style and made it modern. He’s a “get it done” kind of guy. He’s done some pretty crazy stuff. He’ll turn three-wheelers into four-wheelers and four-wheelers into side-by-sides and crazy contraptions. What’s the craziest request you’ve gotten from a client? A bar built out of a truck. That idea came from Dave, the owner of Atlas (a Bloomington bar). We’ve been friends for a long time, and he’s always coming up with wild ideas. It’s in the bar, but it’s not done. One of these days we’ll get to it. It’s a 1957 Chevy Apache and Dave got it off of Craigslist. It’s only the cab. I took the entire inside out and left the shell. We left the outside completely the way it was, with old patina paint. When it’s done, the roof and the windshield and the hood will open with a cable hoist in the ceiling on a big hinge in the back. It has a three-tap kegerator and it will have ice bins — basically a fully functioning bar.